Among the Henduan Mountains, there are four adjacent peaks that comprise the 450-square-km Four-Girl Mountain Range. It is combined with the-Shuangqiao, Haizi, and Changping gullies and the Four-Girl Mountain. Four Girl Mountain gets its name from a famous local legend. It is said that the place was once hard-hit by chilling northern winds, which devastated the locals' livelihoods. One day, four sisters from some remote southern region turned into four mountains to shield the place from the northerly attacks. The area then became warm and sunlit, with rich harvests of grains and fruits. In honor of the four sisters' great deed, local people named the mountains after them. More than 10 snowy peaks surround the four mysterious peaks of the Four-Girl Mountain, among which, the 6,250-meter fourth peak is the highest, second only to the 7,556-meter Gonggar Mountain, which is "the King of Shu Mountains" in the Sichuan area. 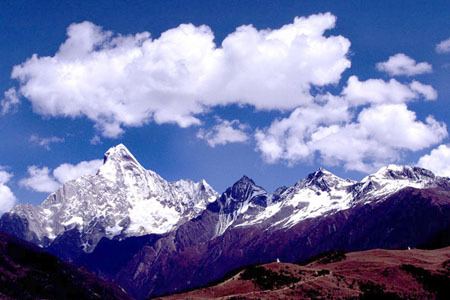 The elevations of the first, second, and third peaks are 5,355 meters, 5,454 meters, and 5,664 meters respectively. Like four girls, the pretty and charming peaks are as white as ice and as pearly colored as jade. The precipice of the fourth peak is so high that nobody has ever climbed it. Just some 10 years ago the Four-Girl Mountain was absolutely isolated from the world. On the mountain, some original ecological scenery is preserved, attracting people to appreciate its mysterious beauty. Today, the Four-Girl Mountain consists of a group of scenic areas and is a multi-faceted tourist site where people can enjoy sightseeing, mountain climbing, exploration, scientific investigation, holidays, and outings.